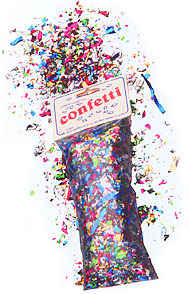 Tip: Use flake confetti instead of glitter! 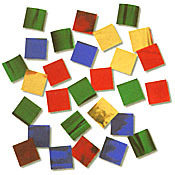 2" Square Confetti Part #43175 1/2 oz. solid and assorted colors. 12/case Part #43172 50 lb. Bulk. Larger size for easy clean up. 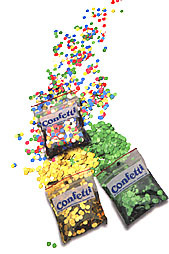 Tip: Sprinkle on table for extra color and to enhance your centerpieces! Extra thick for easy clean-up. Tip: Sprinkle in a greeting card for that extra “surprise”!